• Honesty: telling the truth and • Integrity: acting in accordance with ethical values. These values are also integral to the role and success of police leaders. Chief Constable Neil Dubord, Co-chair of the CACP Ethics Committee believes that fairness is key to being a credible leader. He remarks, "When dealing with any type of promotional process, fairness is integral. Career development is very important to our people and nothing is more damaging than the perception of an unfair process." The benefit for organizations that participated in the original survey is the ability to benchmark progress between the two. The second survey is designed to complement the first, and Dr. Maguire comments that "the ability to make a comparison between surveys will allow police leaders to understand if progress has been made in their organizations. 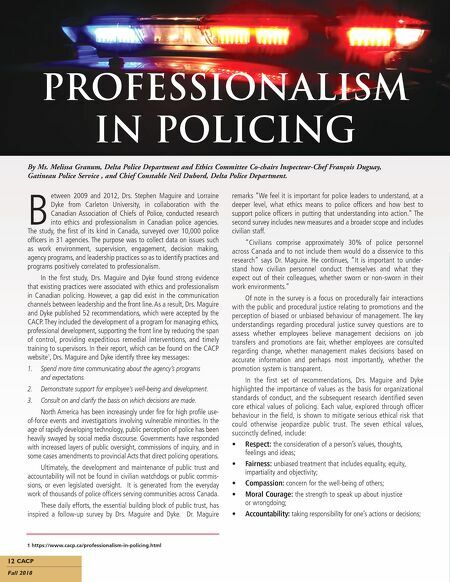 The intent of this research is to help Canadian police leaders create tools for developing ethics programming, and to connect new found knowledge to management practices and decisions. This work has essentially become a longitudinal study and I am excited to begin analyzing the results of the second phase." The CACP has a fundamental role in protecting the relationship between the public and police. "The inundation of negative news stories and social media feeds can adversely impact the thousands of ethical, professional, highly-trained and well-intentioned police officers who show up every day and work hard to keep our communities safe," comments Chief Dubord. He continues, "Our police officers are facing increased levels of workplace and occupational stress, and waning public trust can exacerbate the issue. The research being conducted by Dr. Maguire and Dr. Dyke will help the CACP and police organizations across the country build a solid strategy in not only maintaining the confidence of Canadians, but to start to rebuild damaged relationships as well." The topic of ethics and professionalism is iterative and needs consistent and prolonged development. With emerging technologies that change not only the type of crimes that are being committed, but the way police conduct investigations, ethics will be ever-more important. "How predictive policing interprets algorithms and data needs to be examined, and that requires further exploration," comments Chief Dubord. "We don't yet know what the future holds in terms of ethics and the use of technology, making it critical that we keep the conversation – and the research – going." 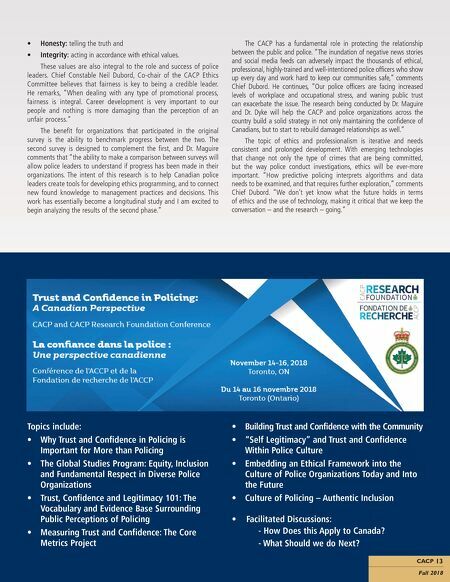 CACP 13 Fall 2018 Topics include: • Why Trust and Confidence in Policing is Important for More than Policing • The Global Studies Program: Equity, Inclusion and Fundamental Respect in Diverse Police Organizations • Trust, Confidence and Legitimacy 101: The Vocabulary and Evidence Base Surrounding Public Perceptions of Policing • Measuring Trust and Confidence: The Core Metrics Project • Building Trust and Confidence with the Community • "Self Legitimacy" and Trust and Confidence Within Police Culture • Embedding an Ethical Framework into the Culture of Police Organizations Today and Into the Future • Culture of Policing – Authentic Inclusion • Facilitated Discussions: - How Does this Apply to Canada? - What Should we do Next?